BELIZE CITY, Thurs. Mar. 26, 2015–The Opposition People’s United Party (PUP) today responded to the budget presentation made two weeks ago by Prime Minister and Minister of Finance Dean Barrow – a budget which Opposition Leader Francis Fonseca said “had nothing to offer,” apart from political rhetoric and grandstanding. “What they offer is more of the UDP agenda of tax, borrow and spend,” Fonseca said. The Opposition Leader also said that Belize now appears among the top 20 worst countries for its high debt-to-GDP ratio, which is around 80%, and which he quoted at $2.7 billion, excluding the money the Government will have to pay in compensation for “botched nationalizations…,” which, he said, will cost Belizeans hundreds of millions of dollars. 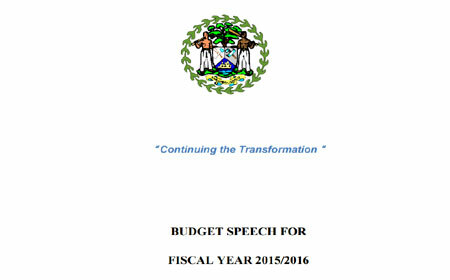 “The 2015-2016 budget is a borrow-and-spend budget,” said Fonseca, adding that it offers no economic development plan, no new investment in the Belizean economy, no new tourism projects, no new agricultural investment, no new manufacturing project, no investment in arts and culture, no investment in youth and sports. Replying to the Opposition, John Saldivar, Belmopan area representative for the United Democratic Party, challenged Fonseca’s claim that the budget is a “borrow-and-spend” budget. Saldivar, in his comments, announced Government’s plans to construct a new $30 million hospital in Belmopan, as well as the financing of the national security strategy with a $30 million loan from the Central American Bank for Economic Integration (CABEI). Saldivar, who is also the Minister of National Security, said that his ministry is being allocated $132,991,515, an increase of about $15.4 million, and $96 mil or so of this has been scheduled for salaries, while $35.9 million has been earmarked for operational costs. Fort George area representative for the PUP, former Prime Minister Said Musa, had the floor after Saldivar. He said that the Belizean society has become deeply fractured and divided. He said that the beautiful tourist destination of San Pedro, Ambergris Caye, has been described as La Isla Bonita, with its long stretches of white beaches, but there is a dark side to this beauty and opulence – that is the back-a-town areas of San Pedro: San Pedrito and San Mateo. There, Musa said, you will find laborers living in swamps, filth and abject poverty. San Pedro has become two towns: one that glitters for the tourists; the other that is a ghetto where hardworking families live, which, Musa said, is a symbol of what the country of Belize is fast becoming. He said that even as the Prime Minister is saying that Belize is in the midst of a PetroCaribe bonanza, poor, struggling working families of Belize are not feeling it. “The truth is that while a few, the well-connected, well-off are getting richer, the poor in Belize are getting poorer – a fact we perhaps don’t like to talk about!” said Musa, alleging growing poverty, growing economic inequality and social inequality in Belize today. Also speaking on the public debt, Musa, a former Minister of Finance, said that the UDP administration has accumulated $1 billion more in debt, growing it from $1.7 billion to $2.7 billion in just 7 years, while it took successive governments from 1981 to 2008, 27 years to reach an external debt of $1.7 billion. He said that while Barrow boasted of his government’s spending muscularity, Barrow made no apology for a $141 mil financing gap in the budget, and the even more disturbing primary deficit of $50 million. He said that when the PUP left office in 2008, the government had a primary surplus of over $100 million in the Treasury. He spoke of budget cuts for police training ($900,000); crime investigation ($700,000); natural security intelligence ($500,000) and also a cut in the Belize Defence Force budget of $761,000, while the budget for the Ministry of Foreign Affairs for overseas representation (via embassies and consulates abroad) increased from $12 million to $15 million. Collet area representative for the United Democratic Party, Patrick Faber, said, in reply to Musa’s comments of the prevalence of ghetto conditions in certain parts of Belize, that these areas crop up because people sometimes squat in undeveloped areas because of their need to survive. Faber said that the Government has tried, as with the outskirts of Belize City, to keep up with the situation. Faber spoke of the development of infrastructure in areas such as Cayo and Corozal, as well as the recently announced upgrade of the Hummingbird Highway. Later on, Faber, who is the Minister of Education, Youth and Sports, noted that the budgetary allocation this year for his ministry is $240 million, representing almost a quarter of the national budget – and insisted that none of it was diverted into his pocket. Faber also refuted the Opposition claims that the Barrow administration has racked up a debt of 1 billion dollars, and said that the accrued debt was only half what the PUP had claimed – at about $500,000,000. The Opposition Member for Orange Walk Central, the PUP’s Johnny Briceño, said that while Faber boasted of the Barrow administration spending 25% of the budget on education, it was the PUP back in 2007-2008 that carved out that allocation. Briceño also pointed to a projected $12 million increase in tax revenues this year, up from $804 million in the 2014-2015 budget, and noted that the largest portion comes from everyday hardworking Belizeans through the General Sales Tax (GST), as well as taxes on income, properties, etc., but, Briceño said, the Government has not demonstrated how nearly a billion dollars in taxes has been distributed across the nation. He said that he is waiting for Barrow to report on how his administration has worked to reduce poverty. Briceño said that the Barrow administration has been employing “Band-Aid style economics” – and, pointing to the reaction to the previous PUP budgets by Housing Minister Michael Finnegan (who was absent due to the death of his mother), Briceño said that while Finnegan used to call the PUP’s budget a monkey in a blue dress and say that the PUPs were pulling wool over people’s eyes, it is in fact the money outlined in the present budget that is wearing a red dress – “as he would say, a monkey in a red dress is still a monkey!” Briceño said. Briceño said that a primary deficit of $50 million indicates that the Government did not have enough money to pay its bills, and so it had to borrow to meet those commitments. Briceño also claimed that since taking office, the Barrow administration has borrowed over $700 mil, including $286 mil from PetroCaribe alone, and this year, another $100 million in debt was added. Now, said Briceño, Barrow wants to change the law, because he wants to borrow PetroCaribe money at will – something, he said, they will not let him do. According to Briceño, the proposed 2015-2016 budget offers no hope to thousands of young people who in two months’ time will be graduating, and it will not improve health for all Corozal people as promised, since the National Health Insurance Scheme will only be rolled out in constituencies that have UDP representatives, he claimed. Orange Walk North area representative, Deputy Prime Gaspar Vega, Minister and Minister of Natural Resources and Agriculture, said, in defending the Barrow budget, that it sets the stage for this government to continue to transform Belize through further investments in infrastructure. Vega also addressed the recently erupted controversy over the proposed importation of Guyana rice into Belize, and the alleged price gouging of consumers. He said that the Government will arrive at a solution that will satisfy all concerned parties, after doing the necessary consultations. He indicated that the Government cannot completely liberalize the importation of rice from Guyana – despite claims that it would be cheaper for consumers – because it would kill rice production in Toledo by milpa farmers. He said that although Guyana is Belize’s sister CSME country, they must understand that we must balance regional trade with our security needs and must ensure that our industry is not irreparably harmed. Vega said that it is a rather complex issue, and the concerns he raised were vocalized at a preliminary meeting held on March 17. Vega said that he is sure that after the consultations are done, all parties will come to a point where everyone will be satisfied. In her presentation to Parliament, the PUP’s Belize Rural Central area representative Dolores Balderamos-Garcia spoke of several issues of national importance, and salient among them was the need for the Government to implement measures to ensure traffic safety, particularly at Mile 8 on the George Price Highway and at the Philip Goldson International Airport junction on the Philip Goldson Highway. The “crying need to slow down the traffic going through” these areas, Balderamos-Garcia said, was underscored with the recent death of a Stella Maris student, who, she said, died in the hospital recently because of refusal of the persons who are in authority to do something to slow down the traffic in the area. As we reported in the last issue of Amandala, Austin Olivera, 12, was knocked down in Ladyville last Wednesday while crossing the road to catch the bus to school.